This year is the first in a long while that January is a big question mark for me. I’m trying to be positive but I have no idea what US legislation and laws are going to change my life or others I care about or what basic human rights are going to be at risk. I know I’m not alone out there. I find myself donating money to causes that I feel are constantly in need with aplomb. I’m signing petitions left and right and have my national representatives on speed dial. But my last-week-of-December traditions must go on. Every year I buy a new wall calendar with big write-in boxes. 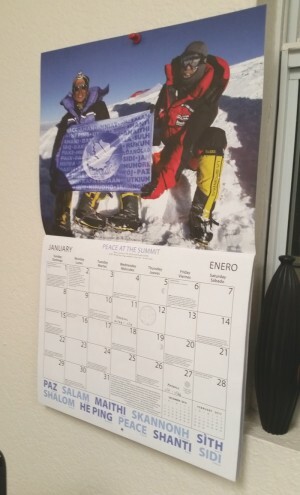 I then add the semi-monthly payroll dates for the whole year (our staff likes that) and wait until January 1st to hang it. I’ve been looking for a calendar that denotes events that mean something to me and not just those designated by Hallmark. Cultural Survival used to produce a small calendar that I could use to transfer these noteworthy events to a bigger National Geographic calendar but they stopped making the calendars for some reason. I even emailed them suggesting they make some kind of electronic one but I didn’t hear back. This year I stumbled upon the 2017 Peace Calendar put out by the Syracuse Cultural Workers. There were no dimensions of the calendar but I took the chance that for $15.95, I’d be getting a wall calendar with the necessary write-in blocks. And I was not disappointed. In addition to calling out dates that support the principles of fair trade like Equal Pay Day (April 12th) and World Water Day (March 22nd), it also acknowledges World Fair Trade Day (May 13th this year). I will report to them that they should update the associated website from www.ifat.org which is now a dead link but baby steps. And while I do in my heart like the concept of a day that “protests earth-destroying consumerism” called Buy Nothing Day that coincides with Black Friday, I do run a business that needs people to buy stuff. I guess the Syracuse Cultural Workers, whose mission “is to help create a culture that honors diversity and celebrates community; that inspires and nurtures justice, equality and freedom; that respects our fragile Earth and all its beings; that encourages and supports all forms of creative expression” yet relies on the purchases of calendars, tees, buttons, patches, etc. probably agree with me. Maybe we can change Buy Nothing Day to Only Buy Products That Do Good Day. With all of the online specials throughout the holiday season, it seems that Black Friday has lost some of its magic as the start of holiday shopping so why not make it a day with meaning? Let’s replace the frenzy with thoughtfulness and start the holiday gift season on a positive note. The day after they can buy their wall-size TVs. I took the liberty of creating a printable calendar with a few of the notable days from my 2017 Peace Calendar that we’ll be promoting in our retail store and you are welcome to do as well. Wishing all of you a sane, caring, non-violent, healthy, and most important, peaceful 2017. Hope to see some of you in Washington DC on January 21st!